When we see photographers at work, they’re usually on one knee, pointing up at the sky, getting great angles and messing with various bits of expensive equipment to get things just right. It looks like an exciting job that is made perfect by the use of expensive lenses, lots of equipment and a keen eye. Getting “that” perfect shot is a mixture of luck and experience that culminates in a portfolio of work that looks like it came from a genius. However, the truth is usually very different. I was recently visiting a friend, and I stayed at a very small hotel. It only had a few rooms, but as I was relaxing in the bar, I noticed they had a brochure on a table, and I flicked through it. The pictures were stunning. I asked one of the staff if they’d hired a professional. I was shocked. These images were definitely of professional quality, and it looked like a lot of care and attention had gone into getting the lighting, positioning and composition just right. It looked like the work of someone who was at the height of their art and had been doing it for some time. At that moment, Dave walked in. He was wearing an overall with pain all over it and looked nothing like a typical photographer. He was called over and introduced to me. It turned out he was just about to do some night shots for the website, so he offered to show me the setup. I had to take him up on the offer! The Hotel was very well situated in a small village, so surrounded by countryside. We went outside and for the first time, I noticed that it was also very well lit. He showed me his camera. It was an old Canon which looked quite battered and bruised, but he had bought a new lens recently from a charity shop. This guy knew how to be frugal! Opposite the hotel was a small village green, and it was here that I noticed the secret to his photos. On the green, he’d already set up two decorator’s ladders and positioned a plank between them. On top of the plank was his tripod (someone had given him it) and when we got to the green, he climbed up it to attach the camera. He suggested I shouldn’t follow him up for safety reasons, and I wasn’t going to disagree. The light was perfect. The sun was now just below the horizon and the sky was that deep red-blue with a few hints of cloud in the distance. It was the perfect frame for the hotel, now lit with its own lighting. Dave headed back down the ladder. Here was trick number two, something all good photographers know. When you’re taking a photo, a tripod is obviously essential if the light is low. In fact, I try to use one whatever the light. The reason is, you can’t be totally still, it’s almost impossible. However, even if you use a tripod, if it’s resting on something that will move or vibrate when you step near it, then it defeats the object. So, you use a remote (preferred) or the timer. Dave set the timer, got off his ladders and went to wait. We heard the click, he shot back up the ladder, checked the camera and after a noise that suggested he was satisfied; he headed back down again. That was it. The perfect shot. There are a number of things we can take away from this. The first is that none of this was down to luck. Dave knew exactly what he was doing, and he knew exactly when to take that photo. He had done it lots of times before. He knew the perfect place to set up his camera. He worked at the hotel and so he knew every inch of it, but he also knew the surroundings. He knew where to go to get the perfect shot. Secondly, he didn’t need the best equipment in the world. You could pick up his camera and lens for around $300 these days, probably less if you scoured charity stores. Finally, he knew how to make the best of what he had. He was a maintenance guy, so he used ladders and planks. In this case, it was the perfect solution. Dave’s experience is what makes photography so worthwhile. It’s also what makes them good. It’s very rare that someone can just be handed their first camera and shoot perfect photos. It takes time to learn the craft and get the experience. 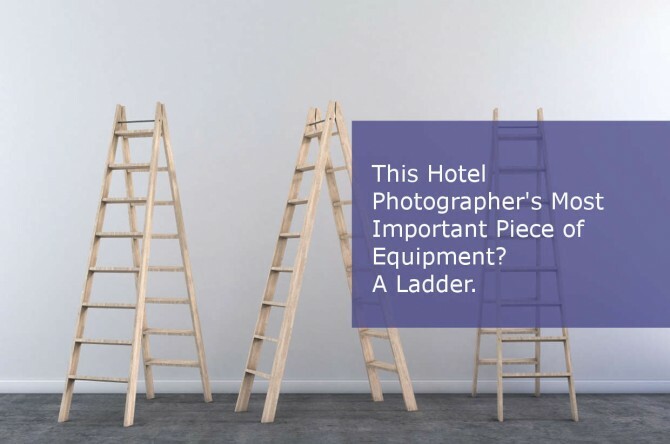 So, when you’re hiring a professional hotel photographer, you’re not hiring the equipment, you’re hiring the skill and the experience, and sometimes, the tenacity.